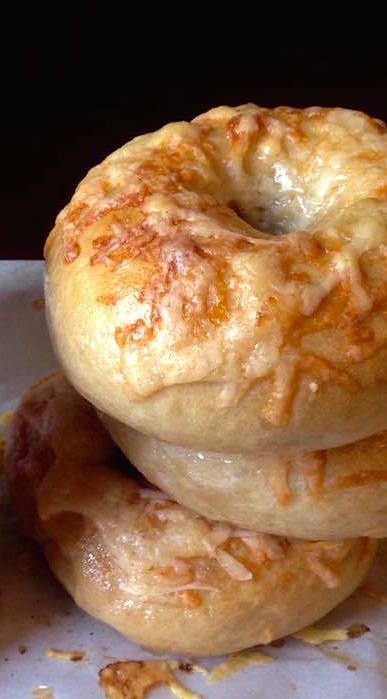 If you know me at all, you probably guessed that I am not the maker of these bagels. Firstly, because I am known to destroy anything that requires the least amount of patience and/or precision and secondly, because you know that Samuel is the master bread baker around here. Actually though, I wasn't such a bad bread baker myself in my prime, before I realized that gluten was poison to my poor gut. I even kept a sourdough starter for a while (see here), but I must have gotten bored of it because somehow I never got good at making these wonderful sourdough creations that Samuel has mastered. 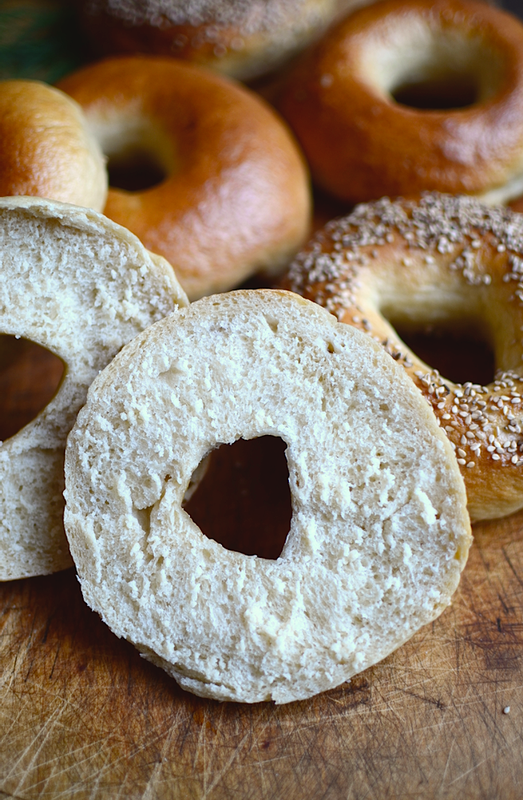 After much trial and error (as seen on Instagram), Samuel has finally perfected his bagel recipe. 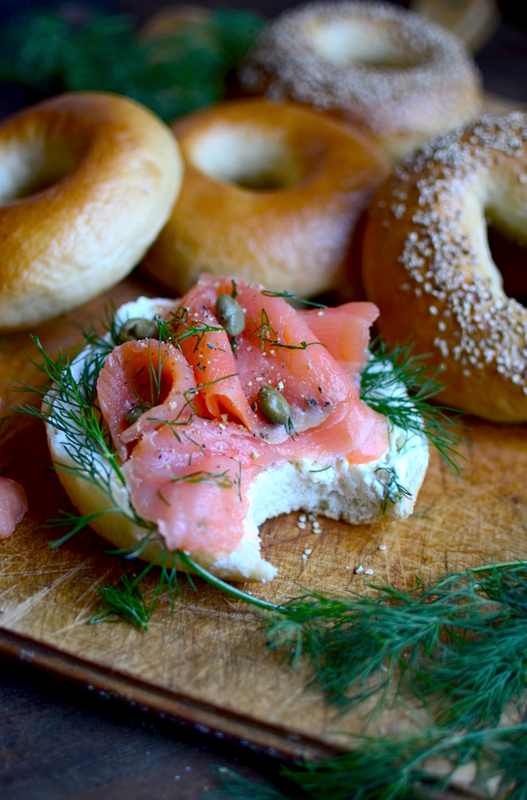 They are soft, fluffy, chewy, and perfect for lox bagels. 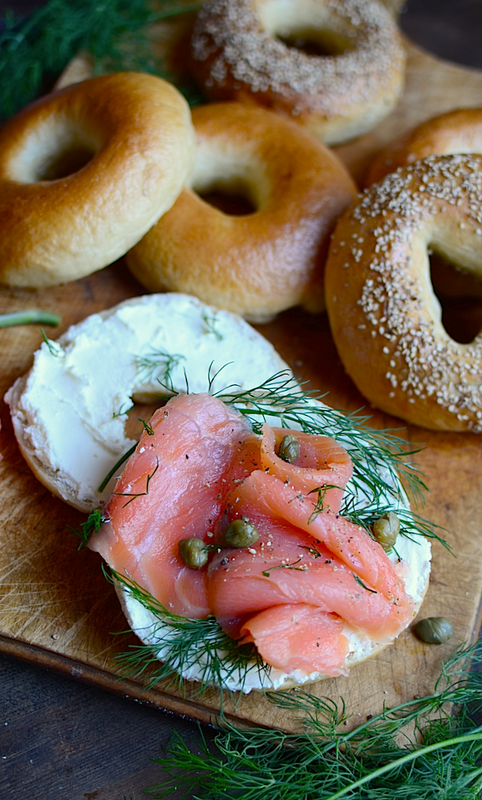 Just throw on some cream cheese, smoked salmon, fresh dill, and maybe a few capers and you're good to go. Yammie is taking care of our son right now, so I thought I would take over from here. This is Samuel. 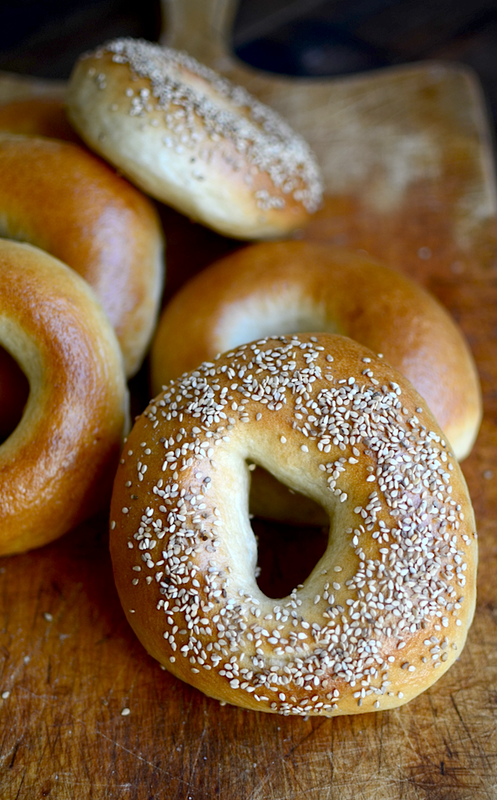 These bagels are fun to make. It's best if you have a sourdough starter and follow the recipe that way. But if you don't have one and don't want to make one, just replace it by throwing water and flour together with a little yeast, mix it together, and leave it overnight. That will give you something sour to add to the recipe in place of the leaven in the morning. My favorite part about baking is cutting it all up when the dough is ripe and smooth. It's kind of like steaks at a butcher. It looks appetizing even raw, but it would be kind of nasty to eat. Make a hole in them any way you'd like. I explain how I do it below, but if you have a better way, try it out. I try not to touch it anywhere besides with my two fingers in the hole. That way the surface remains as smooth as possible. 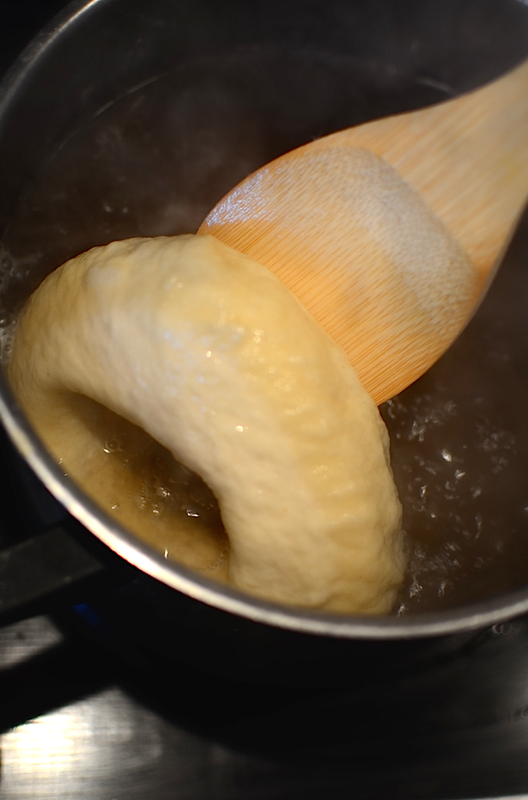 When you boil them, be careful not to dent them. Be gentle with them and use some sort of flat utensil that will inflict the least amount of scars. This is especially important when taking them out. I didn't use that spoon. I think I used a spatula, so that the water could drain from the bottom. This is the hardest part of the process for me. This recipe uses baker's percentages, which is much easier to use than specific measurements, especially when using a starter. With it, you can adapt the recipe to however much you want to make. Quick lesson on baker's percentages: the flour is always called "100%", and all other ingredients are a percentage of this total flour weight. For example, flour in this recipe is 500 g. Water is 240 g. If flour has 100% baker's percentage, water has 240/500 = .48 = 48% baker's percentage. I've put specific measurements on here, too, in case you prefer it. Mix all the leaven ingredients together and leave overnight. Should yield 100 g. Ready when it passes float test (when a small amount dropped in a glass of water floats). Mix well the 100 g leaven and the yeast into 200 g H2O (we save 40 g for later). Add barley malt, sugar, lard, and 200 g flour. Mix well. Add rest of flour (300 g), mixing 100 g in at a time. Add 12 g salt and 40 g H2O (the rest). 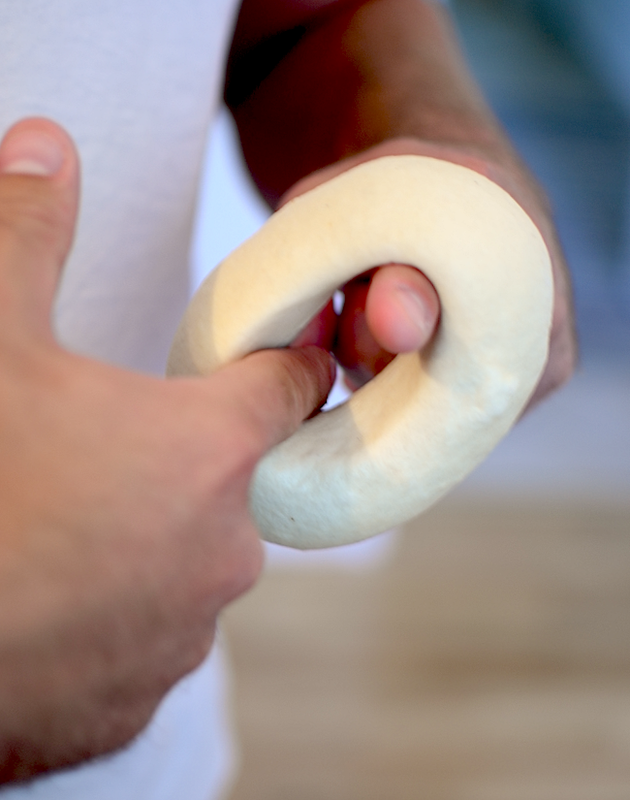 Mix well with hand, squeezing dough between your fingers to work salt into dough. Knead for 10-20 minutes until it passes window test*. Cover to rest for 2 hours or until about double in size. Form 6 or 7 balls. Let rest for 1 more hour. Start boiling water with about 1/2-1 teaspoon salt and a couple teaspoons barley malt. Make holes in the dough with your finger, spin dough with two index fingers in the hole until hole is about 1 1/2 inch wide (see pictures above). The hole will shrink while baking. Preheat oven to 425ºF. 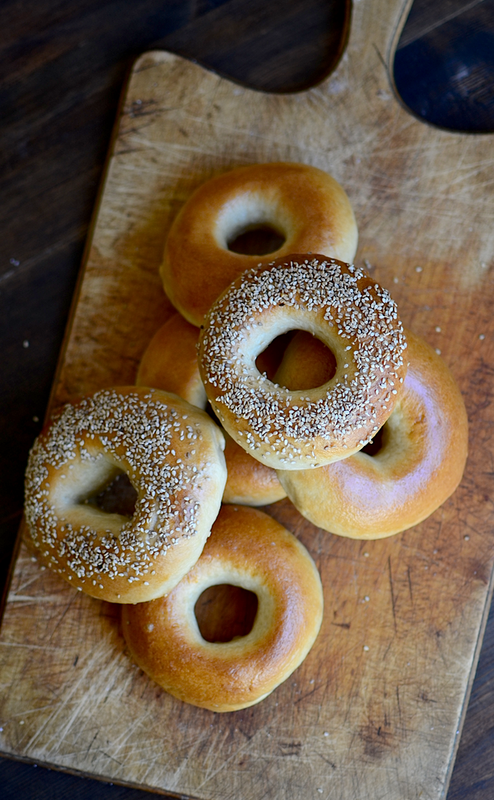 Boil bagel dough for 1 min on each side. 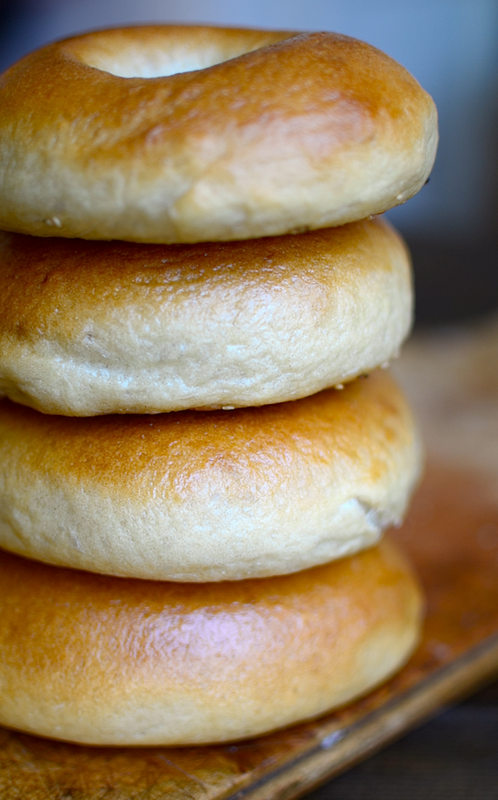 Let them dry on a plate until all are finished boiling. Transfer to parchment paper and brush them with one egg white beaten with two tablespoons of water. Add any toppings you want. Bake at 425 for 20 min. Cool 30 min before cutting open. 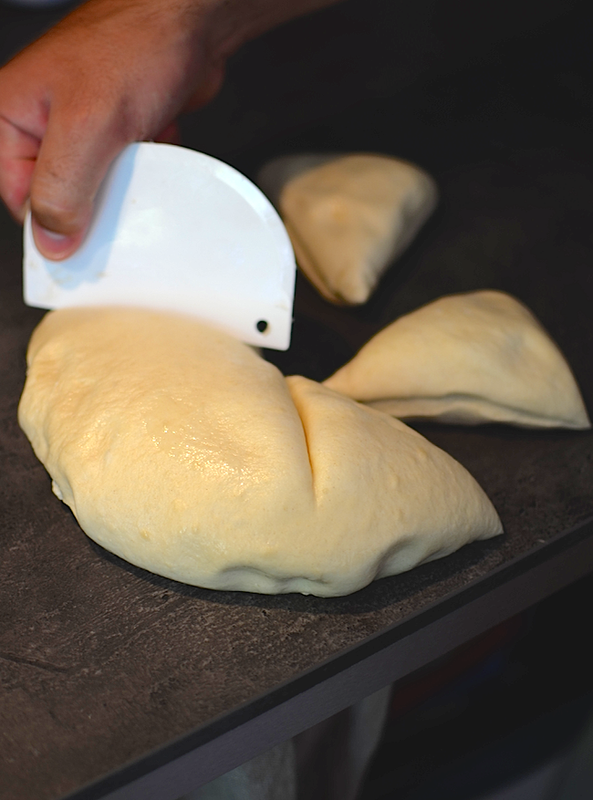 *Passing the "window test" is when you can stretch the dough until it becomes transparent, like a window, without ripping.